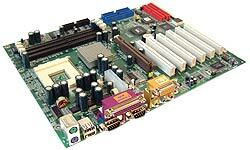 This particular Epox EP-8K3A+ motherboard (AMD socket 462) was retired after several years use due to a significant number of burst, bulging or blown electrolytic capacitors. Smaller board mounted capacitors were unaffected. - 13 of 13 of the motherboards 2200uF capacitors (maker: GSC) failed due to burst/leaking capacitor syndrome. - 4 of 6 of the motherboards 6.3v 1200uF capacitors (maker: GSC) exhibited burst/leaking/bulged tops. - 0 of 2 Teapo 6.3v 1500uF capacitors failed. 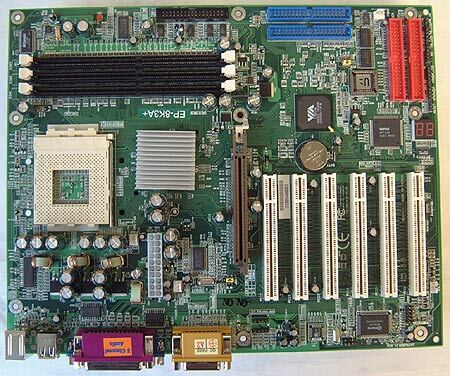 Even though Epox was one of the first mainboard manufacturers to produce a motherboard based on the VIA KT266A chipset the 8KHA+ remains one of the finest boards out there, and one which continues to enjoy a fiercely loyal following. When Epox announced the release of the KT333-based 8K3A+ many wondered if they would be able to reproduce the successes they had enjoyed in the past. Like the 8KHA+, Epox has set their sights directly on the enthusiast market. To satisfy such demanding markets (after all we want bleeding edge, not cutting edge) Epox included a few features which managed to eclipse the hardware. The biggest selling was not actually a hardware feature, but rather one tucked away in the BIOS of the spritely green PCB. The 8KHA+ had several lines of code in the BIOS which allowed users to manually tweak the memory voltage levels upto as much as 3.2V. Such features are really handy if you want to explore the upper limits of the system. Curiously, processor voltage tweaks remained limited to 1.85V max (probably a good thing for the Athlon processor). With the new 8K3A+, you can now set your CPU voltages all the way up to 2.2V, which means performance users have more room to breath, and tweak! Obviously only the more extreme overclockers would use those options (they can cause longevity issues with the processor), but it's nice to know they are there. With a retail price of $195 CDN ($150 USD) the Epox 8K3A+ follows in the footsteps of its predecessor and is a very good value. There is onboard 5.1 audio (using the much belighted VIA's AC'97 codec), IDE RAID, and the ever familiar Port 80 diagnostic LED's. As far as expansion slots go there is a 4x AGP 2.0 slot, six 32-bit PCI's, four USB 1.1 ports and three DIMM slots which support up to 1.5 GB of PC1600/2100/2700 DDR RAM. PC2700 DDR RAM is also known as DDR333, but we'll get to that in a moment.